Preheat the oven to 425 degrees Fahrenheit. Line a baking sheet with parchment. Take the streak out of the refrigerator and let come to room temperature, about 30 minutes before you're ready to cook it. Season well with salt and pepper. Heat a large pan (cast iron if you have it) over medium-high. 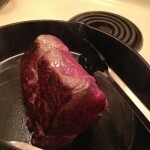 Add about 3 tablespoons of oil to the pan and sear meat on all sides until golden brown, about 8 - 10 min. Drain the excess fat from the pan and set aside to cool. Heat another large saute pan over medium-high. 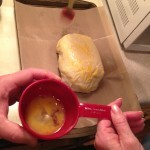 Add 3 tablespoons of butter add the shallots and a pinch of salt and cook for 2 to 3 minutes, until softened. Add garlic and cook just until fragrant, about 1 minute. 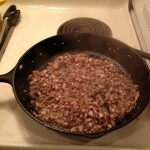 Add the mushrooms and thyme, season with salt and pepper and toss to incorporate. Saute for 5 minutes, stirring occasionally, until the mushrooms are cooked and there is very little moisture remaining in the pan. Remove from heat and allow to cool. Roll out the pastry on a lightly floured surface to about 3 to 4 inches longer and 5 to 6 inches wider than the tenderloin. 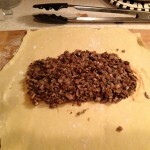 Brush the center area with the mustard and spread the cooled mushroom mixture onto the pastry, piling mostly in the center. 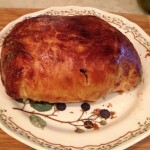 Place the meat into the center of the pastry. 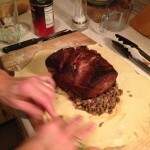 Fold the dough around the beef to cover completely and seal by pressing gently. 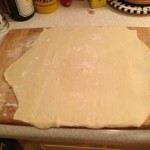 Transfer to the parchment lined baking sheet, seam-side down. 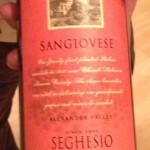 Brush with the egg wash and season with salt. Bake for 30 to 35 minutes, until the pastry is a nice golden brown and the internal temperature reaches 125 to 130 degrees Fahrenheit for medium rare. Remove from pan and allow to rest. 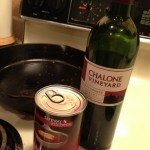 Return the original saute pan over a medium heat; deglaze with red wine, scraping up the crispy bits with a wooden spoon. Whisk beef stock, remaining butter and the creme fraiche just until warm.